I'm back again - seeing as we're still online, but I suspect it won't be for long. So I wanted to write a little post about what I got up to yesterday. But first of all, a big thank you for your lovely comments about the house and our move to Skye. The place is still in complete disarray but we're very gradually working our way through the piles of boxes and bags hurriedly stuffed with all kinds of things, some useful and some not. This past week or so has been incredibly hot and sunny. We've always come to Skye on our holidays at just this time of year and it's always been like this. So if you're ever planning a trip, that could be worth considering. Walking Joe to and from school is a real joy as we pass by fields full of buttercups and cuckoo flowers. Cow parsley, bluebells and plantains are flowering in the long grass too, and the gorse releases a strong coconut scent in the heat. My flowers are still pressing away in the studio and I'm hoping they'll be ready to use soon. 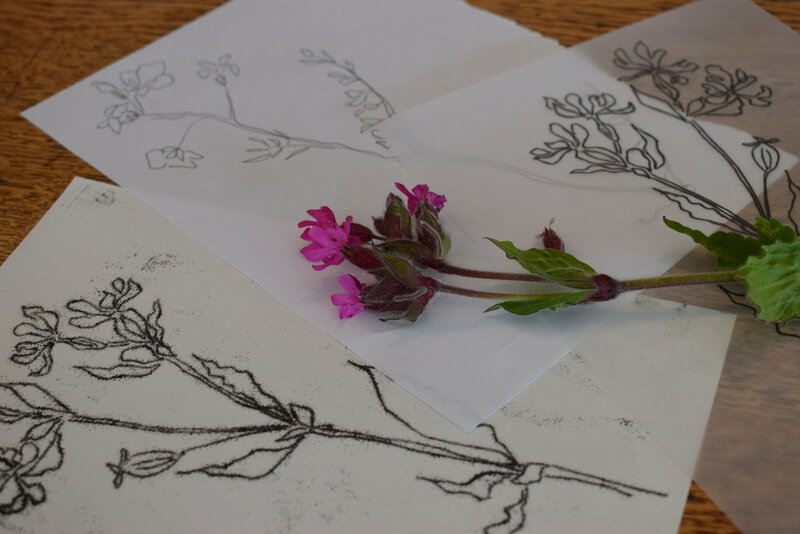 Yesterday I ran my first taught session, botanical monotype printmaking. It was fully booked within a week of being advertised. So late last week I was feeling the pressure as I wrote lists of what needed unearthing and taking along. A brief lesson plan (you can take the girl out of teaching etc), several baskets of supplies and I was more or less ready to go. No, I didn't sleep too well the night before. I'm perfectly fine teaching a class of children, either primary or secondary, but there's something about addressing a group of grown-ups that's very daunting indeed. Those grown-ups also happened to be paying customers. And Skye's a small place. It's very likely I'll bump into them again in the near future. Of course, they were all friendly and enthusiastic. It was a very informal workshop - I did a little introduction and showed them examples of my own prints. We talked about line drawing and plants, then headed outside for coffee and a plant collecting session in the sun. Back indoors, everyone made sketches and I showed them the technique for making monotypes. The whole thing took place at Bog Myrtle cafe. It's the place I was longing to reopen after the winter, when we were living in that isolated house and cabin fever was setting in. It's run by Shaun and my friend Renee. It's half-cafe, half-vintage bookshop and Renee is keen to get lots of creative stuff going on there. So between us, she did the advertising and bookings and provided the homebaking, and I ran the session and brought all the materials. The tea and cake at the end was a great chance to get to know some of the ladies a bit more, like Sarah from North Child. She's a knitwear designer, natural dyer and keen reader of Creative Countryside. She also lives in Plockton so I'm planning on heading her way during the summer. And the proceeds are going into my etching press fund. So that waiting list is definitely something to be pleased about!